The Truth About Basically Everything: Steven is home!! !/The day Shayna found love at Chuck-a-Rama? Steven is home!! !/The day Shayna found love at Chuck-a-Rama? 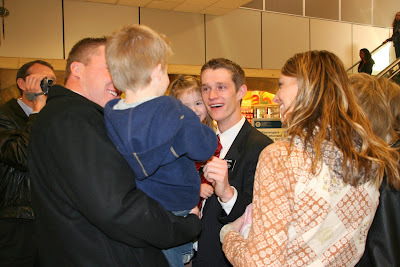 My little brother Steven came home from his mission today!!! 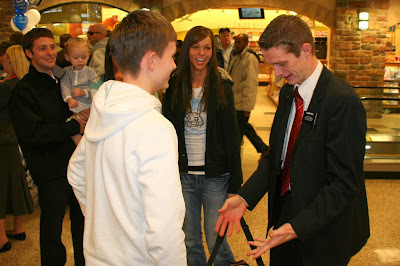 He was serving in the Louisville Kentucky mission. My whole family was at the airport to meet him, except for my sister Kristen and her husband, Steve, because they are in Kansas (sniff sniff), and it just wasn't the same without them, but we understand. 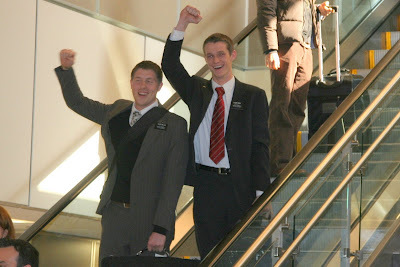 It was so cool because there were several other missionaries coming home and their families were waiting for them at the bottom of the escalator by us, but you wouldn't have even known the families were there because they just stood there until their missionary got down to the bottom, and then there were a few embraces and maybe a few tears. Bor-ing. BUT, when Steven appeared at the top of the escalator, our whole family just gave this big spontaneous cheer and it was like this gigantic welcome and everyone was laughing and crying and hugging and it was so fun. Steven got to meet his two new neices and a new brother-in-law, and he seriously didn't even recognize Aaron. When he left Aaron was just a little kid, and now they are almost the same size. He kept saying, "This isn't really Aaron, is it? It can't be." Aaron was like, "I swear, it's me... " That is what is going on in this picture, and that is my beautiful sister Shayna in the background. Which brings me to my next topic. We all went out to eat at the Chuck-a-Rama in Bountiful. We had a huge table in the back and kind of had the place to ourselves, just being kind of rowdy like we always are when we get together. Well, then this guy comes in and sits down at a booth nearby. All by himself. And he just sat there and watched us the whole time, more specifically, he watched Shayna Bayna, and I could tell he was trying to figure out what the whole deal was because she was sitting by Steven and were they brother and sister, or was she the girlfriend... it was pretty funny. He must have got 10 plates of food, and every time he got up his eyeballs were just ON HER. So we all noticed it and started teasing her, and Jason told her he would give her $20 if she left him her phone number. Well, he must have been pretty cute, or she was pretty hard up for cash, because she did it! It was great. She wrote her name and number on a napkin and left it on his table as we were leaving and he was up for his third or fourth round of dessert. Then we were all out in the parking lot laughing about it and all of a sudden we look up and there he is! He charged right up to the group and looked at her, and said, "Are you Shayna?" So I think it was love. I ducked into the car so I wouldn't have to be a part of it, but I think they may be destined for each other. I mean, how many people can claim they found love at Chuck-a-Rama? Hopefully his girlfriend that works there that he was visiting doesn't feel too bad about it... Anyway, you are probably wondering why the long story, and honestly it is because my kids fell asleep on the way home from Bountiful and they are still asleep and I must be smoking peyote because I am just sitting here blogging and I should be waking them up because hello it is 7:15 and they are NEVER going to go to sleep tonight. The peace and quiet is just so inviting, though.... okay, Seacrest, OUT! That sounds like such a fun day. BTW - did you know that I grew up in Kentucky? And that I lived in the Louisville mission? How cool that he went there - Kentucky is such a wonderful place! I bet it was so fun to see your brother again. I remember when my little brother came home. 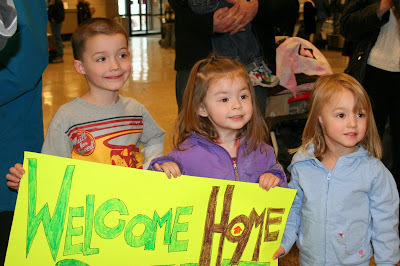 I'm glad you gave him a big loud welcome home! Two years is a long time. Shayna is beautiful. If they end up dating, that will be a pretty fun story. I know what you mean...it's SO hard to wake sleeping kids. I'd enjoy the peace too. You'll have to let us know if they sleep all night after the marathon nap. Oh...I can't believe the little Beeve is already home. He's so cute! I've been bummed that I wasn't there. I just realized that the three oldest grandkids have the same eyes! How funny. And Shayna now has true love...she'll have to tell Kwin, JP, Joel, and the other 50 boyfriends that it's over. Ha ha! I seriously must be so old because Steven just a little kid still, right? Tell me I'm right on that. That's so cool you guys were all there for him. Isn't it so nice to have the fam together? I mean you still worry, but seriously it's so great. Chuck-a-rama love? I am unsure of this. My mom says you shouldn't eat anything with the words "chuck" or "wiz" (think Cheese-wiz) in them. However, I do like the rolls there. I hope Shayna and the guy fall in love and eat at C-A-R for the rest of their lives. haha that is so awesome. i wish i couldve been there to cheer for steven with you guys. and love at chuck a rama? who wouldnt want that? ill be coming to burley this weekend. so see you guys then! that was so fun! Cant wait to see you guys this weekend! Yeah! How exciting to have your little bro. home. I am sure that he was on cloud nine when he received such a great homecoming. Poor other missionaries. I would have been one of the ones screaming, crying, jumping up & down, etc. Your family is all so beautiful. I am sure you all do get a lot of stares when you go places. People probably think that you are all famous or something. Have fun at your yummy food get together. I will just try and picture my self sitting around at your house consuming all of that amazing food :0)!